There is always an interesting debate to be had about whether to ask somebody in the street if you can take their photograph, or whether to take the photograph surreptitiously. I must admit I’m torn between both approaches. I do though use both methods. A case in point being the above picture, where I saw the photograph come together ahead of me and which would have been a totally different photograph if I had waited and posed it. and the late Tony Ray Jones, wouldn’t have been the same if they had asked first. Can you imagine Cartier-Bresson asking, rather than being the invisible photographer observing from the sidelines?. Each photographer has their own approach, and to my mind it is that approach that gives the look of their photography its own individual characteristic. I find myself asking whether that is true of most of todays photographers. Not that I’m in anyway critical, but there does appear to be a relentless sameness to a lot of work. Maybe I have a sense of sadness that fewer photographers stand out today, than in yesteryear. some months later in the same publication the photographer & writer Tim Clinch posited an interesting viewpoint on whether the woman in the photograph knew she was being photographed and more importantly whether the subject would want to be remembered in that way. It’s food for thought and maybe something that needs to be considered carefully. My wife finds it somewhat embarrassing that I don’t always ask, and that can lead to many a terse word. I tend to make less photographs when I’m out with her than when I’m by myself. It’s not that I don’t enjoy her company, it’s just that I have a tendency to worry about where she’s going, whilst I’m looking for the picture. 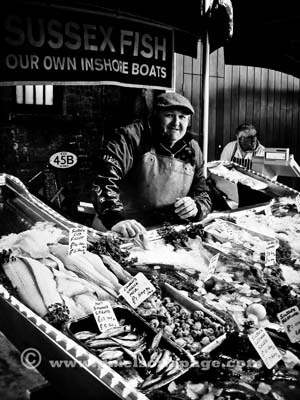 As a contrast to not asking, this is a photograph I took some years back at Borough market in London. I did ask, and the subjects first response was to pose and smile. I waited until his guard dropped and he wasn’t smiling so much and made the photograph. Earlier this year I returned to Borough Market and gave him a copy. For some time now I’ve been looking at material I shot in my early career in photography, and I can tell you there’s rather a lot to look at, both film negatives & transparencies. To simplify the process I chose to work with small bodies of work with a view to scanning them if they were of interest, a rather slow process at present. In the longer term I have to take decisions as to how I show them. Maybe as a book, online or even exhibited. One of the bodies of work I’ve been working with dates back to 1979/80 and is of a “Pram Race” that the local publicans in Kemp Town, Brighton used to organise. Thinking that it might be fun to exhibit these as part of the Brighton Photo Fringe taking place in October this year, I have been trying to fill in the gaps in my memory of the event (and no it’s not dementia) and have found that there are very few people around nowadays with any knowledge of the event. Most of the participating publicans are no longer around and there are even less of the people who raced. Such is the transient nature of what was once a close and rather tight knit community. Not that it isn’t nowadays, but the demographic has definately changed. I originally toyed with printing the images onto newsprint and pasting them up at strategic places around the original circuit or maybe printing QR codes, that people can access via their smartphones or tablets to view the images, as they walk the circuit. You’ll remember I ran a blogpost on Tim Hetherington a while back? Well the good news is that the BBC are showing the Documentary about Tim Hetherington, the British war photographer and filmmaker killed in 2011 during the Libyan civil war, made by his collaborator and friend Sebastian Junger. It wont be available on iPlayer for long thereafter but it’s definately worth a watch. I’ve been fascinated for many years with the story of photography in war. Not in a morbid way, I’m very much the pacifist, but the way war has been and is represented through photography. I suspect, also because I once read Michael Herr’s book “Dispatches”. Michael Herr is an American writer and war correspondent who wrote about the Vietnam war. 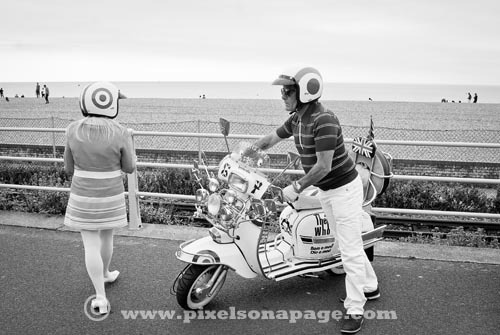 The British photographer, Tim Page gets mentioned extensively in the opening chapters. It has often been said that the use of images from the war in Vietnam, such as Eddie Adam’s Saigon Execution Photograph and the image of Kim Phuc were responsible for the public disquiet which ultimately lead to America’s withdrawal from Vietnam. Which just goes to show the power that an image can have, and convey. I get involved with a local series of talks in Brighton about photography, Miniclick. The Miniclick Photography talks are a series of monthly, free photography and film-making events based in Brighton, often followed by discussions about the nature of photography and ideas relating to photography rather than the “technical aspects, i.e. cameras” . Often thought provoking and insightful. 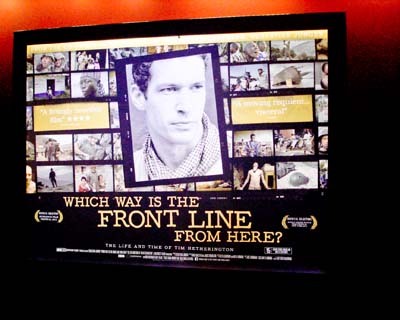 I attended a screening recently of a film “WHICH WAY IS THE FRONTLINE FROM HERE?“. A documentary about the life of Tim Hetherington, a British photographer sadly killed in Libya in 2011. Why the name? And what does it mean? Well it’s a play on words and a homage in some ways to a pivotal book by Harold Evans a former editor of the Times, entitled “Pictures on a Page”. Back n the days before The Times became part of the Murdoch empire. And a very influential book, when I was starting out as a aspirant photographer. It Offered an insight into photojournalism -how photographs are conceived, edited and used in newspapers and magazines. Sadly, long out of print now, I believe, I’d love to get a copy of the book again. I made the mistake once, of lending it to a colleague who had recently acquired a puppy. The book was thoroughly chewed by said puppy and despite the offer that he’d get me a new copy, I never did get one. I was reminded recently when I watched a documentary on a photographer, Tim Hetherington (more about him in another post) of the dedication needed to capture the story and convey it in a photographic form. I’ve often pondered what might have happened if I’d followed a photo-journalistic path rather than getting sidetracked into the world of commercial photography. It’s strange how every so often a series of things come together with a common link. And in this case a personal memory of somebody who was very supportive many years ago when I was trying to set up a community darkroom at a Community Arts project in Kemptown, Brighton back in the eighties. The memory is of a writer for The British Journal of Photography, Ainslie Ellis. What brings this all together for me is an email from a good friend Frank, giving me a link to a short video by Martin Parr, about an exhibition Martin has curated and is involved with, looking back at the work of a great British photographer, Tony Ray Jones. Ainslie had written about and photographed Tony Ray Jones and written an essay for his book, which was to have an influence on Mark Power, a Brighton based Magnum Photographer. Mark was once asked the question , “What was the first photo book that you can remember buying or seeing that really had a strong affect on you?” He cited “A Day Off” by Tony Ray Jones. You can read his response here. I found out the hard way when I started out in photography, that not every photograph you take will be a keeper. Looking back over my archive there are many wasted opportunities. Apart from the wasted film. But there is an upside, I’ve learnt to be more critical and thoughtful. Not in a perfectionist way, but by taking advantage of opportunities at the time of taking the photograph. Changing my perspective, experimenting with a different lens etc. In doing so I gave myself choices. I found that over time my confidence in what might make an interesting photograph surpassed the occasions when I was unsure. Effectively I learnt to be more selective. And guess what? My hit rate increased. Less wasted film or as I’m now almost fully digital less wasted memory space. A while back I was asked to contribute to a collection of photography for an archive run by Queenspark books. Or more specifically, their Brighton & Hove Photographic Collection. In 1972 I was working at Cox’s Pill factory and thinking about photography. I’d just bought my first camera, a Russian made Zenit. I was keen to learn. One my co-workers at the company was a keen photographer, I persuaded him to teach me all he could about developing film and printing. My journey had begun. Out of work hours I either had my head in a photography book or was eagerly finding things to photograph. Music featured strongly in those days, my musical tastes were and still are quite eclectic. A bit like my catalogue of photography over the years. I photographed everything and anything, at least looking back through the archive, that seems to be the case. Much of it rubbish with hindsight, but occasionally a gem or two from an event or occasion shone out. At the time the image seemed fairly insignificant, but over time many of the pictures have become more and more significant helping build up a picture (sorry) of times past . So in many ways, my journey from place to place, job to job continues.